2017 Conference Save the Date & Call for Papers! 2017 THEME - LOVE, LIGHT and HEALING ENERGY: Affirming Near-Death Experiences: Love and healing energy from the Light are the most frequent and powerful messages brought back by NDErs. Affirmation comes from evidence and corroboration of these experiences gained through both personal testimony and research of the NDE phenomena. This conference is for anyone who has ever been touched by a Near-Death or Spiritually Transformative Experience (STE), as well as researchers and others who seek affirmation and greater awareness of the experience. Many people have had this experience. You are not alone. We invite you to submit a proposal for a workshop, lecture presentation, panel session, poster presentation or art display. Promote disclosure, description and classification of the phenomena associated with NDEs and related experiences that affirm near-death experiences. Identify practices and insights that may help those in the healing professions (doctors, nurses, hospice, chaplains) to support NDErs and others with spiritually transformative experiences to affirm their experience. Discuss recent research on near-death-related phenomena and associated experiences, with an emphasis on love, light and healing energy that affirm near-death experiences. Note: Presentations of individual NDE stories will be scheduled on one of the NDEr Panels. If you want to be considered for an NDEr panel, specify that in the abstract. The Objectives, Outline and Degrees sections then do not need to be filled in. 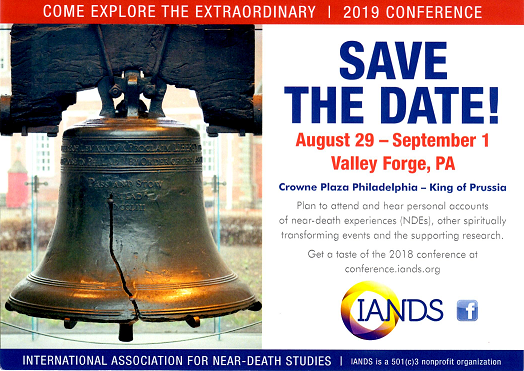 IANDS Policy: IANDS’ purpose is to promote responsible, multi-disciplinary exploration of near-death and similar experiences. IANDS is impartial and open to the presentation of varying points of view. While all personal beliefs are respected, IANDS does not support proselytizing or promoting personal religious beliefs.